A hairdresser comparing swatches to a client's hair color. Hair color products contain a combination of color pigments and hydrogen peroxide used to chemically alter the amount of color pigment contained in the hair shaft, thus changing the color of hair. Three main types of hair color product are temporary, semi-permanent and permanent. 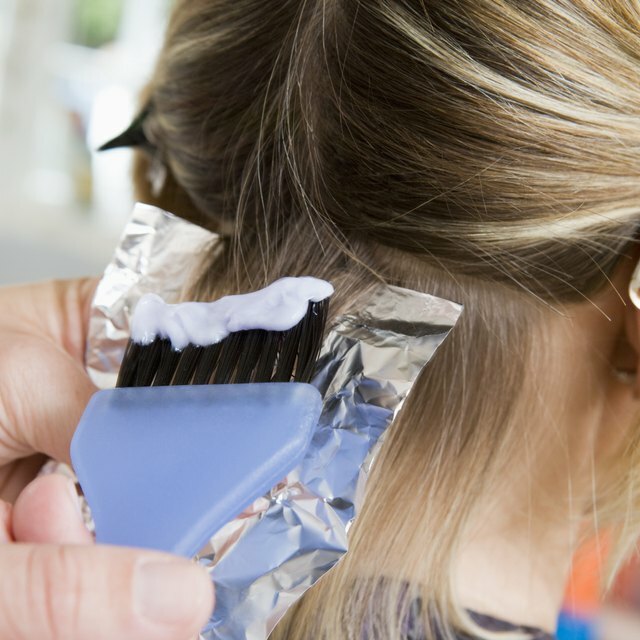 Temporary hair color contains little or no hydrogen peroxide, the agent responsible for penetrating the hair shaft. Therefore, temporary colors merely coat the hair shaft. Semi-permanent and permanent hair colors penetrate the hair shaft. Semi-permanent hair color adds color tint, shine and depth. For example, a brunette wishing for auburn hair could use a red semi-permanent color to add a red tint to her hair. This type of color also changes tonal qualities. It is commonly used after frosting or highlighting to even out, change or cancel undesirable tonal qualities. Since semi-permanent hair color uses low amounts of hydrogen peroxide, it does not penetrate the hair shaft deeply. Since most color pigment is found deeper within the hair shaft, there are several limitations associated with semi-permanent hair color. This type of color cannot lift or lighten color, nor can it cover gray. Drastic changes and removal of the natural color and color base is impossible. With semi-permanent hair color, the changes are made superficially within the hair shaft, resulting in a subtle color change. The shallow penetration of semi-permanent hair color decreases the durability of the color. Lasting approximately 5 to 10 shampoos, semi-permanent hair color gradually fades with each shampoo until all signs of the color are gone, making semi-permanent a great option for those who are unsure about hair color. Many major hair-color lines have color specifically labeled and used as semi-permanent hair color. However, all permanent hair color becomes semi-permanent by changing the strength of hydrogen peroxide to 5 percent, making it possible to temporarily change color with any color line. Permanent hair color is associated with 10 to 40 percent strengths. Semi-permanent hair color temporarily changes tonal qualities in those wishing for a subtle change. It is a favorite among those wishing to enhance shine or "try on" their first hair color experience. It is used to even tone or remove undesirable tonal qualities following lightening. Extreme colors such as red, blue, green, yellow, orange, purple and black are often applied as semi-permanent colors immediately following pre-lightening. What Are the Five Major Classes of Food Additives?